What's the natural thing to do after completing a race like the Crescent City Classic? Look ahead on your running calendar and register for another race, of course! Now's the time to start thinking about the fall racing schedule and decide which events you want to check off your finish line bucket list. Last week, NOLA's own Jazz Half Marathon got even better when Children's Hospital New Orleans announced a partnership with the NOLA.com | The Times-Picayune media group to present the 2014 race. The partnership is still taking shape, and details surrounding the agreement have yet to be finalized, but I'm really excited about what this means in the way of extensive promotion for the race locally and regionally to runners across the Gulf Coast! As part of the introduction, Children's Hospital has a special registration code (NOLATP1) for $10 off, valid through May 15th. That would make the total cost of the registration only $59.02! Trust me, that's a great deal for a half marathon registration fee. Don't want to pay to run 13.1 miles, but still want to take on the challenge while raising funds for Children's Hospital New Orleans? Run the half marathon for FREE by raising donations in the amount of $250, or raise $100 to run the Merrill Lynch 5K. I have a couple friends who have already started their fundraising for this fall race, so get more details now by checking out the "Run For Free" program HERE. 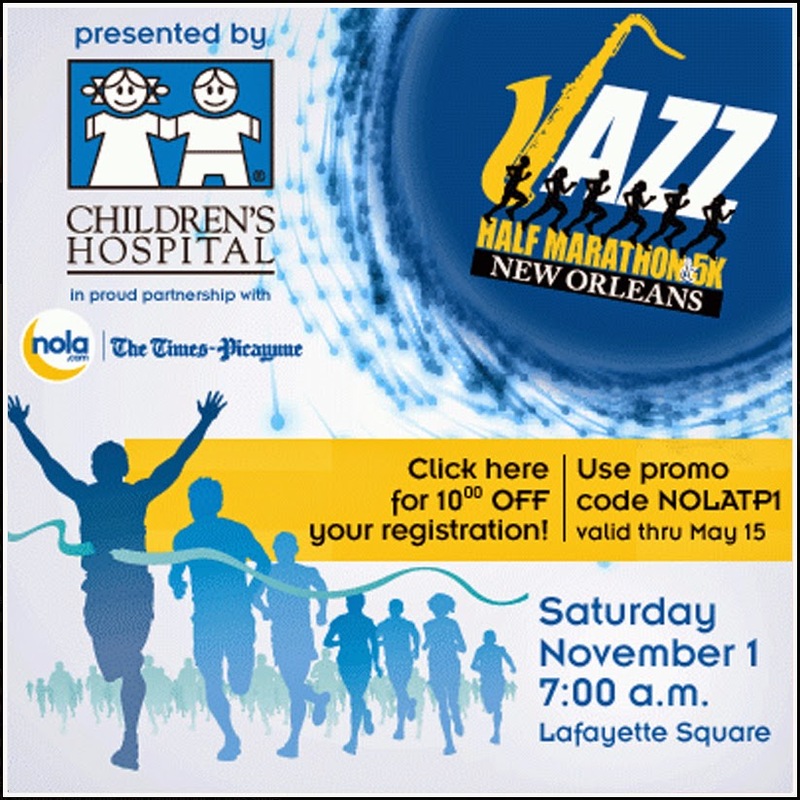 The Jazz Half is Saturday, November 1st, starting at 7am at Lafayette Square in downtown New Orleans. Again, the promo code is NOLATP1 and is valid through May 15th for $10 off your registration. Good luck in your training! This is such a great race. Always one of my faves! Yes, Jen! And this partnership can only help it grow. I'm pretty excited about it.